When we told an English friend that we were going to Wales for a few weeks, he looked at us with undisguised pity. “Bring your own food,” he urged. “Surely you’re joking!” I replied with a laugh. I have celiac disease, and finding gluten-free (GF) restaurant food can be a challenge—even in countries renowned for their cuisine. I must stay away from wheat, barley, rye, kamut, and spelt in all forms, including bread and flour. 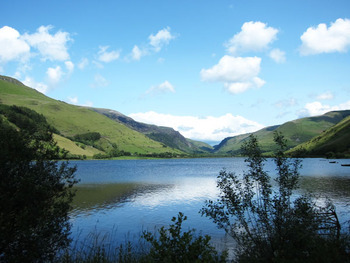 What travails would await me in Wales, I could only imagine. Filled with foreboding, my husband, Gary, and I headed off to Wales to do research for our “Powerful Places Guidebooks” series. Late at night we arrived in Cardiff, capital of Wales, and headed to our B&B. Actually, it was a “B” with only one “B”: bed. Our host offered us an alternative to a homemade breakfast: discount coupons for breakfast at the hotel across the street. The next morning, we strolled over to the hotel’s unprepossessing side entrance, pushed the door open, and walked on faded carpet to the shabby dining room. Plates displaying the gritty remains of congealed eggs, burnt toast, and greasy bacon were piled on the tables. Hesitantly, we approached the barren breakfast buffet. The plastic cereal bins were nearly empty, and the bowl of fruit salad held nothing but a few wrinkled orange slices stuck to the bottom. Apparently, we had missed the early morning breakfast rush. Judging by the unappetizing remains, it was just as well. We began to worry. Maybe our friend had been correct about Welsh food. Hoping we could do better, we hurried to the town center and wandered into the Morgan Arcade. We discovered that this charming, Victorian-era covered shopping arcade is replete with upscale clothing, intriguing knick-knacks, Neal’s Yard Remedies for organic natural health and beauty products—and The Plan Café. A sign on its window indicated that, according to The Independent, it is one of the top 50 coffee shops in Britain. We peered inside. The tiny café was open for breakfast. Not only that, the menu included vegetarian, vegan, organic, and gluten-free options. Looking at the GF cakes and pastries on the counter, I started salivating. “It’s really gluten free?” I asked the tattooed woman behind the counter. I sighed happily. Away from home, I had come home. Actually, The Plan Café was better than home, since at home I don’t buy gluten-free bread. Soon I was greedily thrusting my crisp, buttery gluten-free “soldiers” into runny yellow organic egg yolks and washing it all down with excellent Fair Trade cappuccino. It turns out the “barista” has won numerous awards for the café’s coffees. Gary’s organic oatmeal porridge with seasonal fruit and specialty green tea were equally good. Contented, we promised our friendly server that we would return for lunch. And return we did, reveling in the vegetarian chili, homemade soup, and gluten-free sandwiches. Gary indulged himself with a hot chocolate muffin served with chocolate sauce. Sadly, we soon had to leave The Plan Café behind; we needed to start doing research. 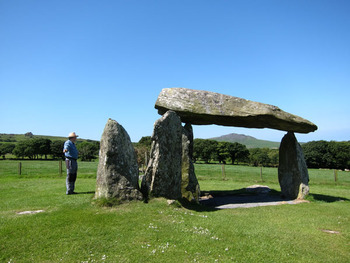 As we traveled around Wales, we discovered many excellent places to eat—and many powerful places, including holy wells, ancient megaliths, mysterious forests, and sites where the legends of Merlin and Arthur still run strong. Eventually we settled for a few weeks in the tiny port town of Newport. We’d chosen Newport as our base because of its location at the edge of the Preseli Mountains (the mysterious source of the famous bluestones at Stonehenge), its accessibility to the long-distance Pembrokeshire Coastal Path, and because it has Fronlas, a café with a gluten-free menu that included a toasted GF ham-and-cheese sandwich. Our noses soon led us to LouLou’s café, next door to Fronlas, which served warm gluten-free brownies baked daily. I was in gluten-free heaven—in the middle of rural southwest Wales. Newport also has several top-notch restaurants, including The Golden Lion pub; Cnapan, a local “fine dining” institution; and Llys Meddyg, “a restaurant with rooms.” Shabby-chic, luxury furnishings and gallery-quality art distinguish Llys Meddyg’s rooms. The friendly owners (Lou, Ed, and Cecelia) pride themselves on their organic kitchen garden, locally sourced produce, fish, and meat. We treated ourselves to several dinners at Llys Meddyg. A three-course dinner cost about $50, but it was worth it for the ingenuity, flavor, and presentation. The food was not only delicious, it was also amusing. 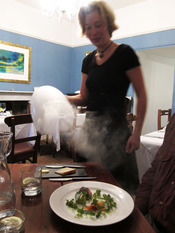 An appetizer of “smoked salmon” consisted of locally cured salmon served under a large glass bell filled with “smoke”; “duck served three ways” included crispy thin slivers of duck breast prosciutto contrasting with creamy duck-liver mousse and pressed duck-liver terrine, drizzled with raspberry vinaigrette. The main courses were invariably good, and the desserts were memorable. For dessert one evening I chose the warm, gluten-free chocolate mousse with homemade passion fruit sorbet, sprinkled with tiny candies that exploded in my mouth like fireworks. I could hear them crackling and popping as I crushed the tiny confections between my teeth. Gary chose “mock poached egg on toast.” It was impossible to tell that it wasn’t a real egg by looking at it. You had to taste it to discover what it really was—and oh, what a delicious surprise! The “egg white” was warm coconut mousse, filled with a hidden globe of bright yellow mango custard “yolk”; the “poached egg” was placed on top of a caramelized slice of pan perdu and accompanied by a color-coordinated scoop of mango sorbet. This edible trompe d’oeil was served with a cup of half cold, half hot green tea. 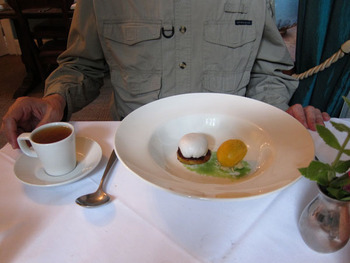 Using some alchemical secret, the chef had divided the contents of the cup vertically in half—and the contents stayed divided until Gary had finished drinking it. We soon learned that Wales is in the middle of a culinary renaissance. Today one can tour the country, eating in delightful inns and staying in charming “restaurants with rooms” that pride themselves on innovative cooking (see www.rarebits.co.uk and www.truetaste.tv). 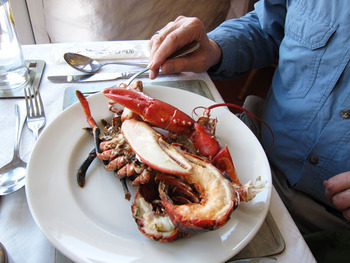 Plas Bodegroes, near Pwllheli in the northwest, boasts a Michelin star. In the southeast of Wales, Abergavenny is known for its annual two-day food festival, the highest profile foodie event in Wales. The September fête includes demonstrations, competitions, master classes, and food stalls (abergavennyfoodfestival.co.uk). According to the Observer Food Monthly, "Abergavenny is to Food as Cannes is to Film - an annual festival for spotting rising stars in Britain's artisan food firmament." Succulent Welsh lamb, tasty Welsh beef, fresh-caught seafood, organic farmhouse cheeses are all gaining new respect and widespread appreciation. Local microbreweries are springing up across the country—including the Gwaun Valley Brewery, just outside of Newport, which we visited during an excursion into the Preseli Mountains. Far from not finding anything to eat, we discovered that there was a plethora of exciting choices. Our difficulty was in choosing. And far from my not finding any gluten-free options, my challenge was to refuse temptation. Along with fond memories, we returned home with several extra pounds apiece. And I don’t mean British pounds sterling. Back in Girona, we showed our English friend some photos of our culinary adventures. He looked at us with disbelief.